Pillows to Help Neck Pain: What is the best Pillow for me? Remember – you spend up to a third of your life sleeping , so investing in a Pillow to help with your neck and Back pain is well worth the time, money and effort. Can pillows effectively relieve my neck pain? Does the position I sleep in affect my neck and upper back pain? The answer to these frequently-asked-questions is yes. Do you know that the natural shape of your spine is influenced by the position of your neck and vice versa? Your neck should naturally have a concave curve in it in any position you sleep - however, we often lose this curve when we don’t maintain a good posture. Losing this curve results in an excess pressure on certain aspects of your neck, which struggles to deal with such pressure. If this poor distribution of pressure on your neck continues over a time - it can typically result in injury and pain. This postural-type neck pain is one of the most common kind of severe neck pain that I see on a daily basis in my physiotherapy clinic. Naturally, the solution to this pain is posture correction. Postural correction is provided through education, awareness and posture exercises to strengthen your neck. It is also helped using a neck pain relief product - such as an orthopaedic pillow - to facilitate a good alignment. Orthopaedic pillows are a firm pillow with a thicker ridge at their base. This ridge is placed under your neck when you lie down and supports good neck alignment in the rest position. Pillows to help neck pain should be chosen carefully - if they are too firm or too soft for your specific complaint, they may result in further pain. If considering an orthopaedic Pillow, it is important that you are properly measured for the size. I always measure my clients neck curves and advise on a specific type and size of orthopaedic pillow for their particular situation. The quality of the pillow is very important. If it is too firm or too soft for your specific complaint it may result in further pain. There are a lot of poor quality neck pillows out there, which you can easily buy without being sure it is right for you - so if you are experiencing neck pain, please seek professional advice before you choose a new pillow. I normally go for a Swiss orthopaedic pillow, or a Jackson roll - for my own clients. 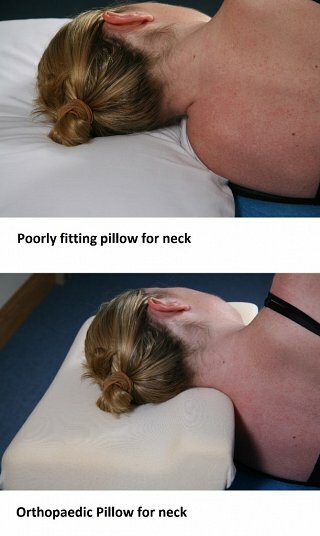 If you are thinking of using an orthopaedic pillow, but are unsure if it will suit you, you can also try a ‘home-made’ support technique for your neck. Try rolling a small towel like a sausage and placing it along the base of the sleeve of your pillow case. It should be thick enough to support your neck without causing your neck to side bend, which happens when the towel is too thick. If the towel size is correct - and does not move in your pillow case - it can often be as effective as an orthopaedic pillow. It is all about the correct size of the neck support and the correct firmness needed to hold your neck in a good position while you sleep. You do not necessarily have to spend a lot of money on a pillow to achieve relief from your neck pain. Experiment. Start by getting a correct diagnosis on your neck pain - especially if severe. Then, if you wish to purchase a pillow - don’t think that just because it costs a lot of money that it will be the right one for you. Experiment with a towel and pillow case - this will give you a better insight into what really works for you.